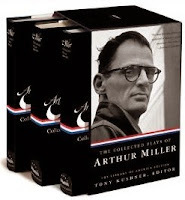 Order all three volumes of Arthur Miller’s collected plays in a boxed set and save $25! In 1942, the year he turned twenty-seven, Arthur Miller was still a struggling author, and he began working the night shift at the Brooklyn Navy Yard. The next year, however, he quit his job when he was hired to write The Story of G.I. Joe, a film adaptation of Ernie Pyle’s Here Is Your War. For the film he interviewed soldiers at army training camps but was fired before the script was completed. Miller would use the material for a book of reportage, Situation Normal . . . , published in 1944 to mixed reviews and tepid sales. His first Broadway production, The Man Who Had All the Luck, premiered that same year to scathing notices and closed after four performances. We had twenty-eight and a half minutes to tell a whole story in a radio play, and you had to concentrate on the words because you couldn't see anything. You were playing in a dark closet, in fact. So the economy of words in a good radio play was everything. It drove you more and more to realize what the power of a good sentence was, and the right phrase could save you a page you would otherwise be wasting. [The producers] didn’t want it that way. It was dangerous. It would put people off the military. But I felt it was better to tell people the truth. . . . It was very moving for me. They were all very young, younger than I was, and marred for life. You couldn’t turn your back on them and I just felt I owed it to them. I was moved terribly by the whole experience, as remote as I was from it. I wasn’t flying over Europe getting shot at. One of Miller’s last scripts written for The Doctor Fights relates the story of three soldiers who have lost limbs in combat and are recovering at Mare Island Naval Hospital, northeast of San Francisco. The episode’s doctor is Captain Henry H. Kessler, director of the hospital’s rehabilitation division, who was played in the original production by Robert Montgomery. (Kessler himself was interviewed at the end of the program.) “Mare Island and Back” is one of six radio plays selected by Tony Kushner and published for the first time in the new Library of America collection, Arthur Miller: Collected Plays 1987–2004, with Stage and Radio Plays of the 1930s & 40s, and it is presented here in full for Story of the Week readers. KESSLER: Hear this! You blessed ones, you lucky ones sitting in your bedrooms with ten pink toenails to clip, and you in your kitchens opening a beer bottle with two living hands, hear this. . . . If you don't see the full selection below, click here (PDF) or click here (Google Docs) to read it—free! This selection is used by permission. To photocopy and distribute this selection for classroom use, please contact the Copyright Clearance Center. 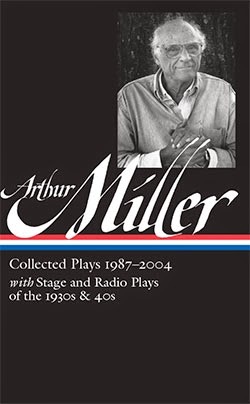 My only intimate contact with Arthur Miller's work was 1965 when, through the Army bootstrap program I was a senior at the U of Omaha where I kept a promise made to my sister and read for a part in All My Sons. All My Sons was a lot more than cheating heroes with faulty aircraft engines.. I'm just going to type what I'm feeling. After the introduction to the story, I was really excited to read it. Especially, when Arthur Miller mentioned how he learned to craft the perfect, concise sentence. I was paying attention to that. Secondly, times have changed, and I've always wondered how soldiers dealt with their injuries suffered from battle in an era where the horrors of war weren't talked about. Nowadays, and ever since the movie Saving Private Ryan, the ugly face of the greatest war against evil brings a new rethinking of what soldiers went through. Miller's story brings a sense of realness, but a positive meaning. I like the story and hopefully youtube might have a video of the actual radio version.